Update with board temps showing? Is that load voltage? Great temps you got there AHoowes. You sure that ain't a Kingpin in secrecy? Wow Precision looks amazing. What a beast of a card! That's load. She dont like 40c. Mostly 38-39c durring bf5. Like I said I think the kingpin would be worth it just for that unlocked power delivery! I cant bench at 2205mhz and more then 8200mhz on the ram all cause of the power limit. Only benefit overclocking and real world gaming use not much.. a frame or 2. 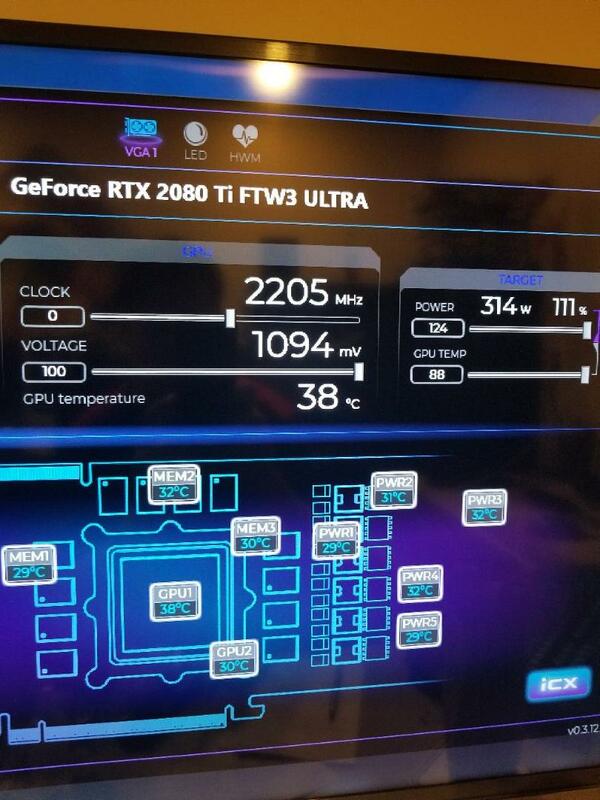 Maybe later on down the road kingpin will release an unofficial bios to up the power limit on the ftw3 ultra card. Haha.. just got 2450mhz ram to run at 2175mhz core clock.. scored 17818 in firestrike extreme. Before I thought I could only run at 8200mhz ram at that speed. Wish I could at 2205mhz. Anyways. I need to start overclocking that 9900k delid CPU with direct mount and hope for atleast 5.2ghz.. see what that firestrike will be then. Just got 2190 to work with 8450mhz ram! 17860 score in firestrike extreme hehe. Sweet. Yep, looks like a load voltage to me. Hey thanks for your afterburner guide to locking the card voltage! Makes all the difference! Heres the link to that AB guide to lock the voltage. Those on a hybrid or stock cooler will want to set a static fan speed first in px1, then close it and open up AB to set the clocks. AB cant control the 3 fans on the ftw3 card.. only the GPU fan. Oh and sajin.. toss out that associate code just encase I or someone wants to buy a new fast card! Great results man I would be stoked with that card. KPE likely won't be able to manage that much better tbh. As for your bios comment... there is currently an Asus XOC vBios with a 1000W power limit out in the wild, if you're up for trying it. Thanks.. I just might after feeling sad prob the next few days missing my 1 opportunity to grab a kingpin inside the return window for the ftw3.. but how can one return such a great card? No prob. If I were in your shoes I would most likely just keep the golden FTW3. It's too bad your return window isn't a little longer; allowing time for some aggregate data to form and gather from via end users on how the KPE's actually perform in the wild. To play devil's advocate...; you could always grab a KPE anyway "just in case" and sell it still sealed if it turns out you don't want to bother. Just don't be a jerk and price gouge someone if you do end up selling it! @AHowes How do you get 2205Mhz with nothing dialed into the clock? Is it boosting to that without an OC? I use afterburner to overclock as it's easy for me to use since I dont need fan control. But one can set a static fan speed in px1 and close it and it will stick.. and then open AB for setting clocks. That was a shot on the 2nd monitor I had px1 displayed on so I could watch all the sensors durring benching. ;) Cool one can do that. Late last night I tried benching and gaming on my 4k 2nd monitor.. just to see how the power was. Wanted to see if 4k would stress the card more and lower clocks. Ran a couple of benches.. firestrike extreme my jaw dropped cause I seen my score of over 18000 for the first time.. I was baffled.. then later on before bed realized it ran faster prob cause there was no gync on that monitor. Forgot i need to turn that off for benching! 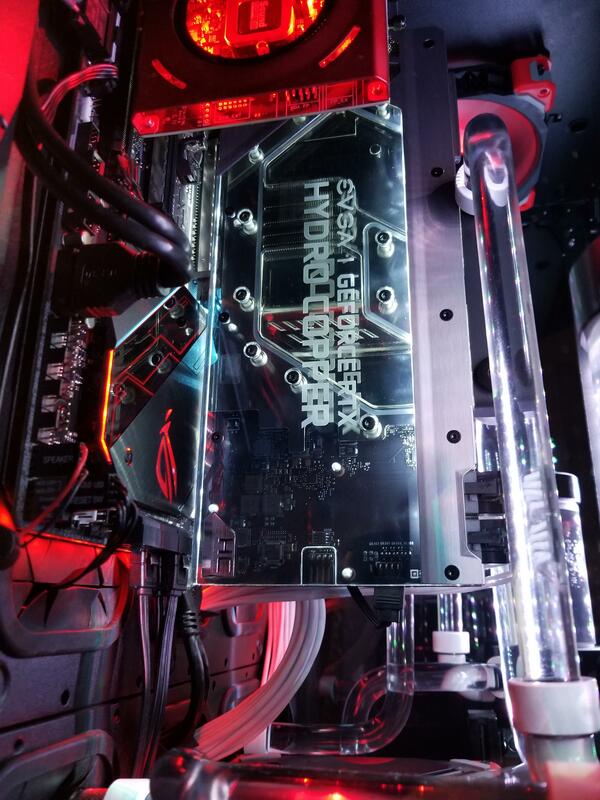 Heres some quick pics of my new build..
Hard to get good pics of the lighting.. but it's just 10x better in person with the white lighting that looks off in the pics. Thermaltake Tower 900 case from prior build..
Upgraded rads from dual EK EX 360 rads to dual EK XE 480 radiators. 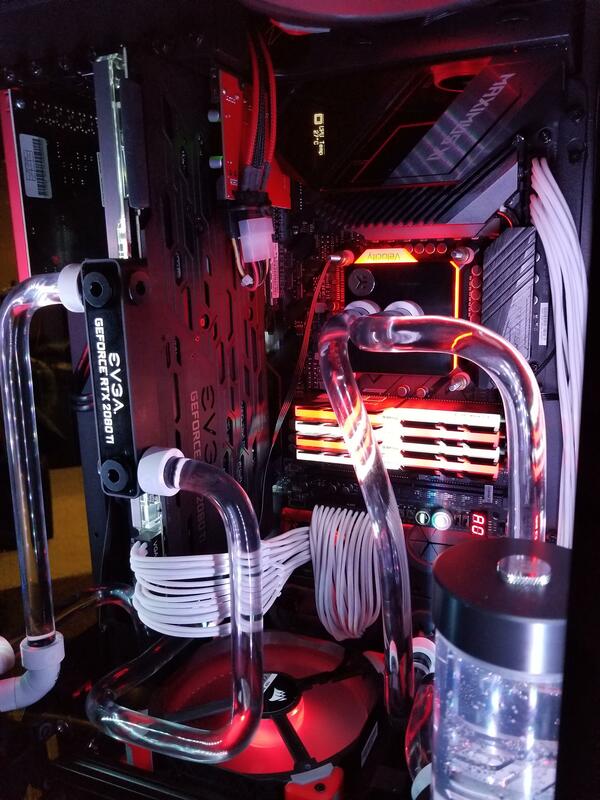 Using dual EK EK-XRES 140 Revo D5 PWM pumps..
First time doing hard tubbing.. really wasn't run like I thought but I'm happy in the end. 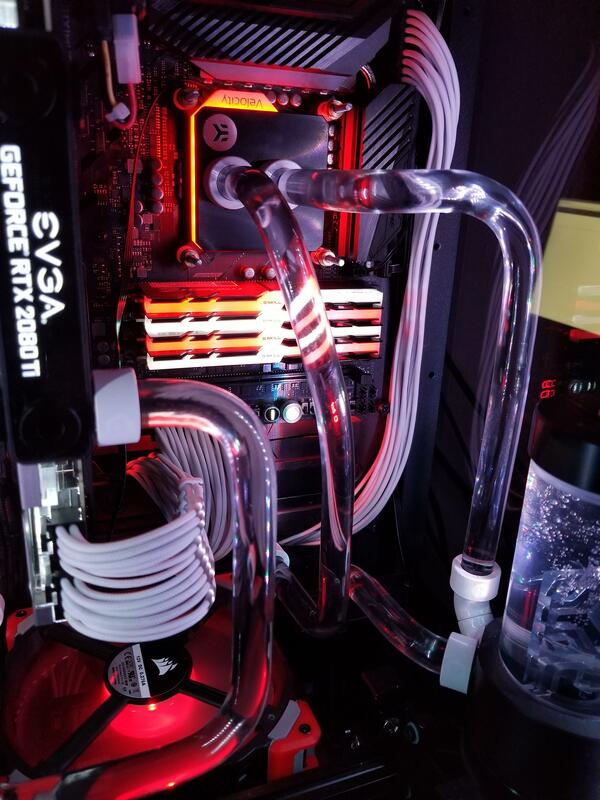 Ek 12/16 PETG tubing used. A ton of fittings in the rear to get those runs hooked up to and from the 60mm thick rads that are like right up next to the psu smashed in between. 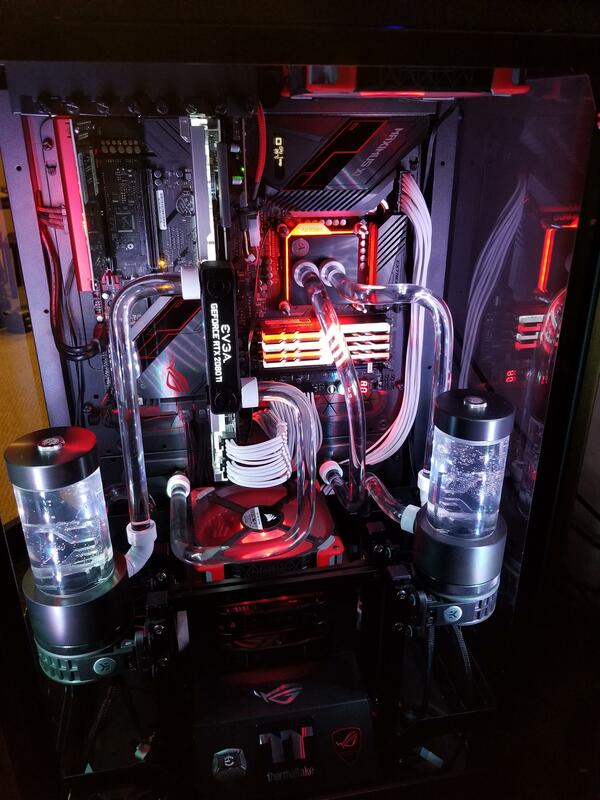 9900k delid with a direct die mount, new EK Velocity RGB cpu water block.. cpu running at 5.2Ghz.. trying for more but fighting prob a IMC that prob dont want to be pushed past 4000mhz for the ram. Currently at 1.36v 1.34v on load low 70's C.
32GB (4x 8GB) G.Skill Trident Z RGB 4266mhz.. has a 16GB kit and just added another 16GB. Asus ROG Extreme XI MB w/ 1TB and 512GB m.2 drives. EVGA 2080ti FTW3 Ultra w/ EVGA Hydro Copper block running 2205/8450mhz for benches.Trying to stay nice at 2175/2190 8200 for games. Pcie usb card for Oculus... hoping I can remove it this time since this board has so many usb connections. Wont know till i reinstall the oculus. Think that's is besides the 5 Corsair ML140 Red case fans and the corsair SP120 HP radiator fans. Oh running a Alienware Dell 34" 1440 Ultra wide G-Sync 120hz monitor. Samsung 40" 4k for 2nd monitor. What camera was used since the images look great with your angled shots and some lighting. Speaking of which, I just got a light box but can't fit my 900D in it for a photoshoot. haha.. Thanks! Used my Samsung S8 phone. I tried with my 5+ year old expensive "back then" digital camera and its real bad. Exactly what I'm doing. Will be using my iPhone 7 128GB with these accessories listed below for an unreal experience as I've done tons of research and read great reviews. Best DIY wannabe DLSR (Can't afford. LOL) project ever. I haven't experimented much with it all but will be doing so soon. I've already seen other consumer's projects and they came out great and couldn't believe the quality of the image produced by all of this. Lots of folks will use this for personal or as a sales use. The best part is all of those companies are in the US and those Xenvo's products come with a lifetime warranty while the studio comes with a 2 year warranty. The LEDs are dialed in, etc. Like I said, if I could throw a 900D in there, I would have had a photo shoot already.